With each new version of Nagios XI, we do our best to include the most important bug fixes, improvements, and features that we can accomplish in a few weeks time. The upcoming Nagios XI 2012r1.4 is going to be a notable release of XI for both performance improvements and internationalization. For our international users, we’ve been hard at work to update XI appropriately for internationalization, as well as kick-starting multiple translations using Google translate. We’ve been working to balance code updates with community contributions for languages, and this upcoming release will ship with a default.pot file that can be used to update user’s PO files that they may have begun populating. This release of XI will ship with kick-started translations in the following languages. For customers with larger installs, we’ve been analyzing bottlenecks in both the monitoring process and the UI to try and make XI run faster and leaner. Users with hosts+services in the thousands will almost certainly see an improvement both in CPU load and page load times in the UI. 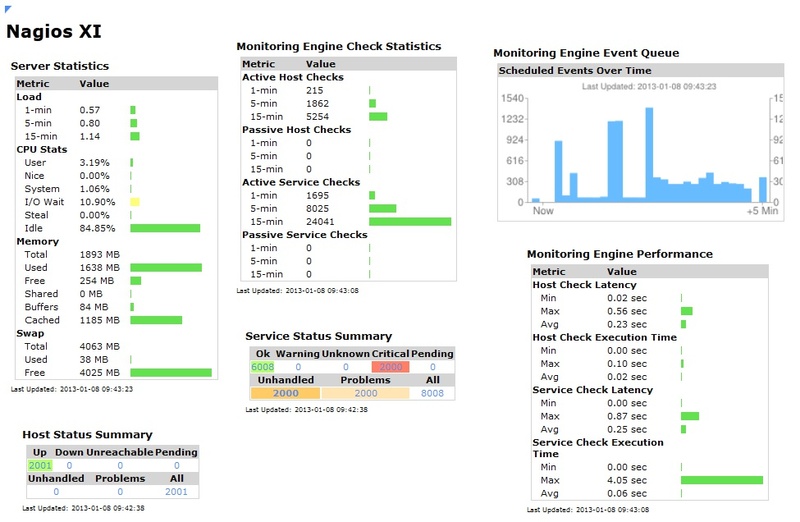 For changes that affect the monitoring process, we updated the Monitoring Engine Event Queue dashlet and the Monitoring Engine Check Statistics Dashlets to all pull data from the same status information that the rest of XI uses, which reduces an enormous amount of data from needing to be logged to mysql from the monitoring process. The end result of this change is that mysql will only need to be doing about 30% of the work that it was having to do in previous releases. For large installs, this is a big deal! The other key change that all users will probably see a benefit from is a refactoring of data queries for AJAX loaded content in the XI interface. Load times for dashlets that contain tactical or summary data went from 15-20 seconds per dashlet down to .05 seconds in local tests with 10k checks. The other upside of this change is that the CPU usage from XI users accessing the interface is substantially reduced. The Tactical Overview dashlets see the largest benefit in load times by far. For users who had to utilize the unified Tactical Overview for performance reasons, we encourage you to try the dashlet version in 1.4. We hope to have 1.4 ready to release sometime this week, we appreciate our community of users and the feedback that we continue to get for our product. Thanks for helping us make XI better! Category: Development, Internationalization, Nagios XI, Performance, UI and Uncategorized. 2 Comments Tags: Internationalization, performance. Nagios V-Shell 1.9 includes major performance updates, and a re-implementation of PHP caching that should decrease V-Shell page load times anywhere from 40-75%. I ran some benchmarking tests on a test system(Dual core desktop with 4GB of RAM) with 1800 hosts, and 7200 services. This system runs with an average CPU load of 2.0-6.0 throughout the day, so the hardware is being pushed pretty hard already from the check load. V-Shell 1.8 created page load times anywhere from 18-28 seconds throughout the interface without APC caching enabled. Needless to say, this is problematic for many users with larger environments. The Core cgi’s were able to load anywhere from 2-11 seconds, with the service status page taking around 9-11 seconds to load all of the data. My goal for 1.9 was to minimize any unnecessary processing, and optimize any functions that were inefficient or using slower PHP built-in functions. The differences in 1.9 are substantial. Without any caching enabled at all, I was able to decrease the average page load time to 9-14 seconds, which is 40-50% faster by itself. Once I had the code optimized, I reworked the APC caching functionality. If a user has PHP’s APC caching packages installed and enabled on their web server, V-Shell will cached the objects.cache file until it detects any changes in the file, while the data in the status.dat file will be cached based on a TTL (time to live) config option which now exists in 1.9. Once the data is cached in APC, the page load times throughout the interface averaged between 4-5 seconds for all pages, which is a 75% decrease in load time on average. My goal for the next version of V-Shell is to add support for mklivestatus and ndoutils for backend data, which will eliminate the need to parse the objects.cache file and status.dat files for systems with those backends. This should further improve performance for larger installations. Category: Community, Development, Nagios Core, Performance and UI. Closed Tags: Front-end, performance, PHP, UI, V-Shell. 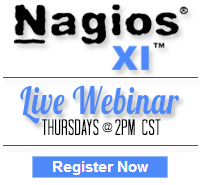 We often get questions about the kind of hardware requirements needed for a particular Nagios installation. As covered in a previous article, this is often a very difficult question to answer since monitoring environments differ so much. Most people assume that for a large Nagios installation, it’s a matter of simply adding enough CPU’s to the machine to handle the workload that it’s given. Although having enough CPU power is important, I’ve found that it’s ultimately not the biggest hardware limitation to the system. A large Nagios installation creates an enormous amount of disk activity, and if the hard disk can’t keep up with the constant traffic flow that needs to happen, all of those precious CPU’s are simply going to wait in line to be able to do what they need to do on the system. I’ve talked to some users who have spent some serious money on hardware to have insanely fast disks to handle their workload, but I wanted to do some experiments in-house for those users who may need to have better performance on a budget. I want to give special thanks to Nagios community members Dan Wittenberg and Max Schubert for documenting some of the tricks that you guys pioneered on this topic.